Traditional lakeland Guest House with beautiful mountain views. This Lake District B&B offers easy access to Windermere Lake and Ambleside. En suite facilities, a comfortable spacious resident’s lounge, conservatory and elegant breakfast room. 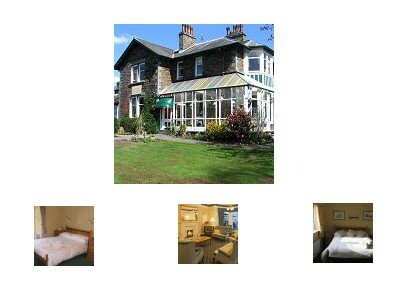 This family run bed and breakfast in Ambleside is in a superb location and offers excellent facilities and service. A range of bedrooms including luxury four poster rooms are available, which offer a jacuzzi bath as well as a shower in the en-suite, a dvd player and complimentary waters and fresh fruit. Guests also have use of the Langdale Hotel and Country Club leisure facilities, which include a 20m indoor heated swimming pool, gym and steam room. This is a 10 minute drive away. Walks direct from the door in the beautiful Lake District from gentle walks around Rydal Mount to more strenuous ascents around the Fairfield Horseshoe. Our B&B is also ideally located for exploring Grasmere, Windermere and of course Ambleside itself. For more information or to book Rothay Garth House B&B Ambleside Lake District, please click on the 'Visit our Website' or 'View Availability' links above.We hope you enjoy your visit to Ambleside, in Cumbria. Our ambleside bed and breakfast is located only a few minutes walk from Lake Windermere and Ambleside. The perfect base for exploring the Lake District for walking, cycling, sailing and visiting the many attractions and things to do.